My experience with internet speeds in Nigeria has been nothing short of a nightmare. I have about 10 different internet links ( with at least 4 active every month. ) 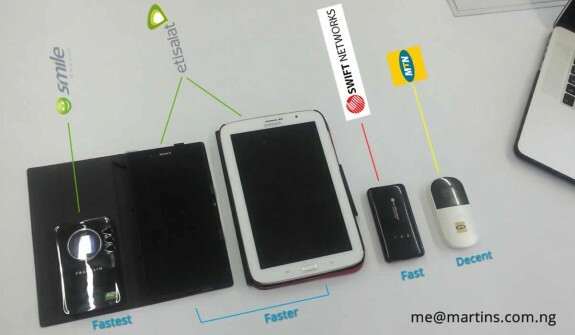 From the 3G offerings provided by the telcos to the recently released 4G LTE packages. For us users, the challenge we face is not only with speed but also reliability. The link works today and it’s super fast and you are happy; try it tomorrow and you are literally pulling your hair out. Over the years I have been hopping around from network to network, from plan to plan, looking for that service/provider that would finally give me “peace”. It hasn’t been easy but I can now say I think I have finally “THE ONE”. I am a very early adopter of technology and love to try out stuff while the doubting Thomases are still making up their minds and I don’t blame them for stalling because I have been burnt plenty myself. The picture below shows all the links ( ok some of my links. I have 2 fixed internet links at home as well ) I currently use for getting online. I have arranged them from left to right in the order I rate them. My MTN mifi was probably my first true love that took me out of “connectivity hell”. It worked pretty well for a while but it simply wasn’t amazing at the time and suffered too many downtimes. I had to let it go. I haven’t used it in like a year though so I can’t tell you if the quality of their service is any better. Next up, my Etisalat link. I love Etisalat like no other network. I feel they just understand me, period. This is the link I used to swear by. I love this network so much that simply by word of mouth I cannot begin to tell you how many of my friends (and enemies of course) who have ported to the network or purchased Etisalat data plans. The link is pretty stable and works most of the time. I am currently on a 20GB data plan on my main line on a Sony Xperia Z Ultra phone and have absolutely no regrets about using this plan or network. I actually thought this was the best I could get and wasn’t looking for a new data plan. I tend to get carried away when I find new technology that I love. I love Smile. Speed test result for this morning attached. 😀 You have just got to love that upload speed. Glad you agree Olu @smilecomsng is the internet link to beat right now. 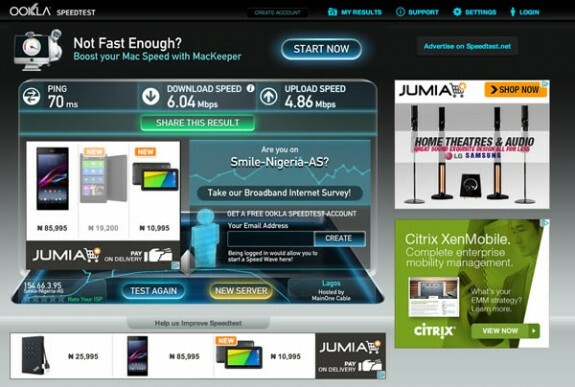 The speed is like nothing Nigerians have seen before.